Mr Porter Sale is now on across everything including fashion & footwear! The truly fashion conscious gent knows that getting the look isn't just about wearing the right clothes, it's about the right everything. From top to toe, shoes, clothes and accessories to the perfect watch, travel essentials and homewear, Mr Porter is the ideal place to find everything that creates your stylish lifestyle. Finishing touches for your home are just as vital as the right cufflinks to make your image as seamless as possible, and the perfect pen and stationery to complete that image in the workplace is essential. For the man who has everything... he probably found it at Mr Porter. 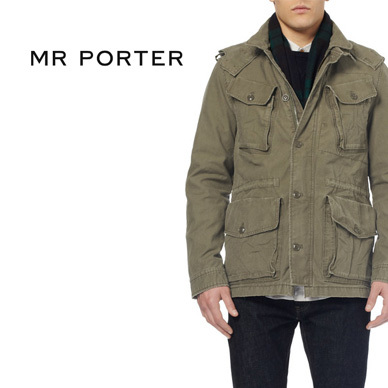 Add Mr Porter to your Favourites list and be the first to know every time they have a Sale on! 1st January 2018 - Mr Porter New Years Day sales for 2018. 7th May 2018 - Mr Porter Early May Bank Holiday sales for 2018, add to your diary now! July 2018 - Mr Porter Summer 2018 sales, joining us? 23rd November 2018 - Mr Porter Black Friday sales in 2018 start on Friday 24th November. Add products from Mr Porter to your Love Sales list. Get the Love Sales button now! Mr Porter January Sale is now on across everything including fashion & footwear! Mr Porter July 70% off Sale is now on across all clothing, footwear & accessories! Spruce up your summer wardrobe today! Mr Porter June 50% off Sale is now on across all clothing, footwear & accessories! Spruce up your summer wardrobe today! Mr Porter's February Sale is on with up to 70% off a fantastic range of clothing, footwear and accessories for men, women and children. Buy now and do not miss out! Hurry ends today! Mr Porter's January Sale is on with up to 70% off a fantastic range of clothing, footwear and accessories for men, women and children. Buy now and do not miss out!